Although for me September undoubtedly signifies the beginning of a new school year, it also means that I get to pull out all those great sweaters and leggings and boots that have been hiding during the summer. The art of layering: mismatching comfy articles of clothing without ever looking “bulky”. It is a bit of a fashion conundrum, yet a task that I always take to diligently. Living in downtown Vancouver affords me the luxury of being able to shop whenever I feel like it, which contrarily means I’m usually a very poor teacher. Nevertheless, to the streets I went today with my admittedly more stylish shopping companion, my brother. 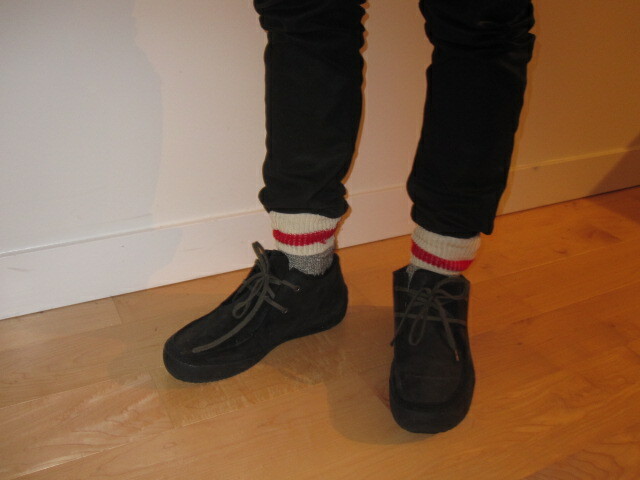 We were on the hunt for a specific fall item, a layering necessity, a comfy must: wool socks. And so you’re thinking, “who on earth goes shopping with their brother for socks? Who is this girl? Who is this guy?” But, my brother and I are two of a kind in that we can easily shop together and give honest opinions to each other. Plus, socks are a neutral item, genderless and necessary to all. The great thing about wool socks is that they work for men and women in terms of layering: men to wear bunched over jeans with Dr. Marten’s or some sort of ankle boot, and women to wear with a mini-skirt or over leggings underneath knee-high boots. I’ll admit that when my brother messaged me to say he wanted to shop for socks, I was more than willing to use that excuse to browse the stores. Since my paycheques have only recently started coming in again since my summer break, socks are a simple indulgence that I can afford, enough to subdue my shopping obsession for the time being.